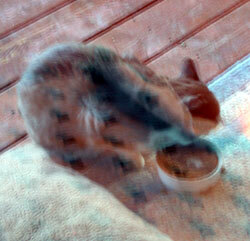 Bob was the second outdoor cat to visit our deck and get a free lunch. He began to come in the early summer of 2002. Bob was a black and white bobtail (thus his name). His coat was a bit shabby at times, so I assumed he was not owned. He was not terrified of me and would allow me to watch him through the door when he visited. He would often get into fights with Kitty-Cat on the deck. I would be sitting in the living room and hear horrible cat screams and banging on the deck. 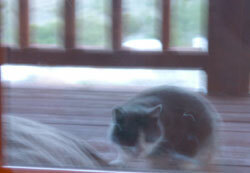 Ultimately Kitty-Cat would win the Bob would run off the deck. Than after a couple of months Bob stopped visiting us. I never knew if something had happened to him, or just was tired of Kitty-Cat bullying him and decided to move on. For this reason I cannot say he has left for the rainbow bridge. Though I did not have a chance to build any relationship with Bob, other than admiring his beauty and the cute way he walked with no tail, I miss his evening visits. Perhaps one day he will return to grace our deck with his warmth. I hope so and shall leave the light on for him.